The Airedale Terrier is a wonderful canine that bodes several desired personality traits. It can easily bond with its family, but be a stern watchdog at the same time. They are rather bright hounds, but with the intelligence comes some days when they may be too stubborn to follow every command asked of them. The dogs are adaptable house pets and will need walked or played with each day for a small amount of time to expend that energy they bode. They also love being in charge, meaning they strongly desire to be the only furry friend in the home at one time. Some work well with dogs that are smaller in size than they are, but generally they do not play well with other hounds. They also have a good bit of energy that will require your attention in walking and daily play activities. The Airedale Terrier is not a suitable dog for sitting in the house all day long. They adore to run and play, and will strongly desire going outdoors for some exercise each day. This type of breed can easily adapt to any climate and may prefer to rest indoors at night. Their grooming requirements will be slightly higher in demand than some other dogs, as they possess a thick and wire type of fur coat that needs maintained with daily or weekly brushing. If the dog happens to be one that is competitive in dog shows regularly, they may need additional clipping and stripping as well. Some owners prefer to have the dog's ears glued as well to ensure the shape of them as the age will achieve that desired V like shape. 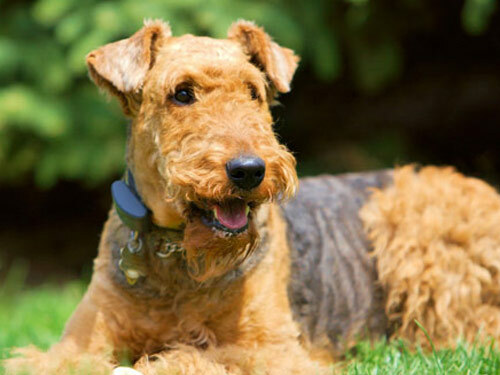 CHD is the most commonly noted health issue for an Airedale Terrier. They can also develop gastric torsion and have issues with an overactive thyroid as time progresses. In some rare cases, they can also develop a colonic disease, but it is not common. Some test screening the vet may recommend as they age is for their hips and the thyroid gland to ensure good overall health. The average lifespan for an American Terrier is ten to thirteen years long. Weighing in at around fifty five pounds, they make a suitable dog for living indoors, but can still roam freely outdoors. The Airedale Terrier is well known and respected as the King of Terriers, for its taller height than most of its breed. They posses the ability to easily hunt any fox or water rats that may cross their paths. Originating in England in the 1800's, they were once referred to as Waterside Terriers or Bingley Terriers, and gained the most popularity as hunting canines. These Terriers are useful for hunting birds, badgers and otters. They are extremely playful and do not put up much of a struggle to train them properly as pups.Today they are more commonly used as family pets, companions and even as law enforcement dogs. An affectionate watchdog at that, it is no surprise they are still growing in popularity in the United States.